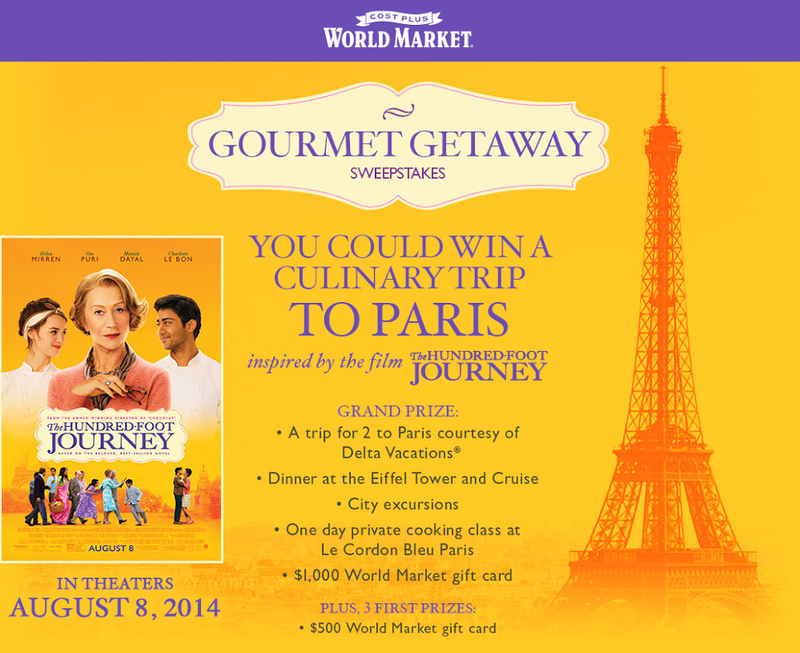 Beautiful Incentives: The Hundred Foot Journey inspired recipes. Plus, Win a trip to Paris! The Hundred Foot Journey inspired recipes. Plus, Win a trip to Paris! Inspired by World Market. I was provided gift card compensation for an informational post and my honest opinion. Growing up I was subjected to all sorts of foreign foods, because I had lots of international friends all through grade school up until college. Most of that exposure was in my private Boarding High School, where it was just a melting pot of people, sharing their cultures. In that time frame I was exposed to the most delectable dishes known on earth. From Authentic Asian, Indian and Italian Cuisine to mouthwatering Cuban and French dishes and beyond. I am no stranger to unique food and I am always looking for the next best thing. What better way to celebrate foodie love across the nation than with the new Disney film, Hundred Foot Journey? It is based on the best-selling novel by Richard C. Morais and stars Academy Award®-winner Helen Mirren. The movie went live just two days ago on the 8th. The film is about a culinary ingenue with a huge talent for creating food from his native country, India. The chef and his family travel to the south of France to open a new restaurant to showcase his foodie expertise. All is well, until a competitive French chef gets wind of it! It looks like such a cute story about foodie competition among cultures and it definitely sounds like something I will enjoy. It's the perfect family night movie as well. What else can we do to celebrate foodies across the nation? We can try delectable recipes inspired by the Hundred Foot Journey! Celebrity chefs, Ryan Scott and Aarti Sequeira were inspired to create dishes on behalf of the new film and I swear these recipes look AMAZING! 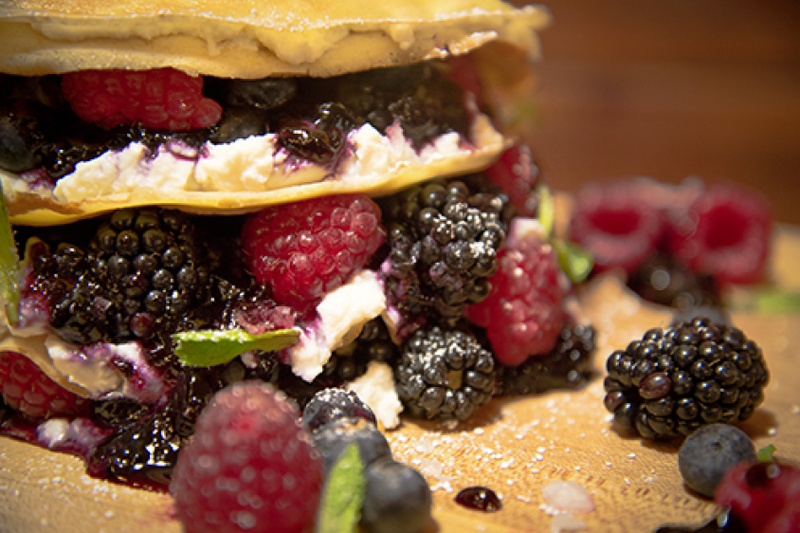 From Main entrees to decadent desserts, you will find it all in their native spread. Ryan Scott showcases some French food. My favorite dish of his that I really want to re-create is the Berry-Ricotta Crepe Layer Cake It looks really easy to do using French Crepe mix from Cost Plus World Market! Aarti Sequeira shows us her Indian Food. My favorite of hers is this REALLY interesting Chai Coconut Ice cream, made with Curry-Chocolate and Ginger Snap Ripple? Um, that sounds divine! It's also easy to make, using convenient Chai mix from Cost Plus World Market. Both these chefs have created mouthwatering and sincerely taste bud TEASING creations, that I will definitely be trying out. Go see the movie and get inspired to re-create one of these dishes! As if that was it! PSHH! If you know World Market and my posts, you know there is always a Giveaway! This is by far the best of all giveaways I have had the pleasure to share and I would not even for a second, put off entering! A culinary trip to Paris wow! I've always wanted to go to Paris, it's on my Bucketlist :) Thanks! I cannot wait to see this movie. It looks amazing. Paris has always been a dream of mine. The movie sounds great too! I'll be entering in the giveaway. Would love to win a trip to Paris! The two things I've always wanted to do would be a dream come true!